Are you planning to have fun in the sun this summer? Of course you are! Make sure your and your family’s skin is protected from the harmful UVA UVB rays. Stay away from toxic sunblock lotions. Instead grab an organic (clean) SPF sunblock that’s toxic free. Our natural organic sunblock’s ingredients protect, nourish, and soothe your skin. With antioxidant healing properties; our sunblock helps delay the visible signs of aging by providing a broad spectrum protection from UVA and UVB rays using the mineral Zinc Oxide. We use FDA approved Non-Nano Zinc Oxide, which is a highly-effective natural mineral that provides a physical-barrier by resting ON your skin’s surface reflecting sunlight away from the skin, similar to a mirror. The Non-Nano Zinc-Oxide and organic sunscreen ingredients we use provide you with maximum protection from the sun and are considered photo-stable, nonirritating, and nonallergenic. 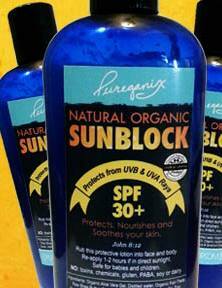 Our Sunblock is child safe, Eco friendly, and biodegradable. *want one? Go to www.PureganixShop.com and grab yours! *Hook up with us on Facebook! This entry was tagged beach, fun, Lotion, organic, pool, skin care, SPF, summer, sunblock, UBA, UVB. Bookmark the permalink.